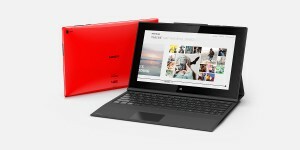 The Lumia 2520 is the first 10.1-inch tablet launched by Nokia with LTE built-in and it’s also the first device to use the tablet-centric Windows RT 8.1 software. Nokia Lumia 2520 has the same 1920×1080 resolution as the Surface 2, but uses a different display technology. It has the same “ClearBlack” IPS LSC panel as the recently launched smartphone Lumia 1520. It measures 267x168x8.9 mm, slightly smaller than the Surface, which was 274x172x8.9 mm. The difference is more obvious when we compare their weight: 614 g and 676 g respectively. The Lumia has a powerful quad-core Qualcomm Snapdragon 800, with 2 GB of RAM. It’s the best mobile processor on the market right now, save for Apple’s exclusive A7, and despite the fact that Surface 2’s Tegra 4 isn’t slow, this is faster. The LTE connectivity is also handy if you use to go to places where Wi-Fi is not available. The Lumia has a quite small internal storage (32 GB), so cloud services options are really a must, and it’s here that the LTE connectivity becomes handy. The Lumia 2520 has a rear-facing 6.7 MP camera, with Zeiss lens, which produce good pictures outdoors with enough sunlight. It’s not the case when the illumination is not enough, even though the camera specifications say that it can shoot with an aperture of f/1.9. However, it has good performance under natural illumination, and the macro functionality works perfectly fine. Under a two-year contract with Verizon or AT&T, it’s $50 cheaper than the Surface ($399), and you can get it free for $499. The Lumia 2520 it’s cheaper, lighter and faste than the Surface 2, and it has built-in LTE. As an option, Nokia offers a $149.99 Power Keyboard cover for the 2520, which adds a full keyboard, trackpad, two USB 2.0 ports, and an included battery.